Long title: Les Estats De La Couronne De Castille, Dans les Parties plus Septentrionales de L'Espange: et la ou sont Les Royaumes De Castille Vielle, Leon, Gallice, Asturie, Biscaie, Seignrie Navarre &c. Copper engraving with outline hand colouring. Overall sheet size: 57cms X 44.4cms; image size: 531mm x 403mm. Small repaired crack at top of centrefold else very good condition. Nicolas Sanson was to bring about the rise of French cartography, although the fierce competition of the Dutch would last until the end of the century. His success was partly owing to the partnership with the publisher Pierre Mariette. In 1644 the latter had purchased the business of Melchior Tavernier, and helped Sanson with financial support in producing the maps. In 1657 Pierre Marriette died, however his son, also named Pierre, co-published "Les Cartes Générales de toutes les parties du Monde."" the following year. 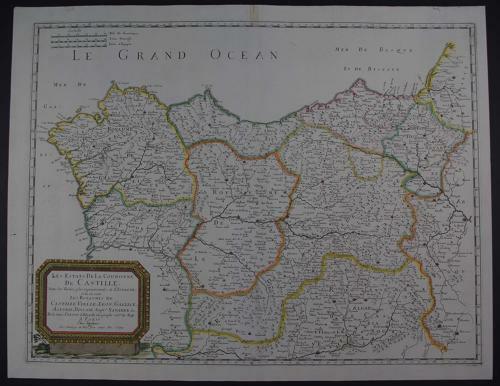 It was the first folio French produced world atlas."